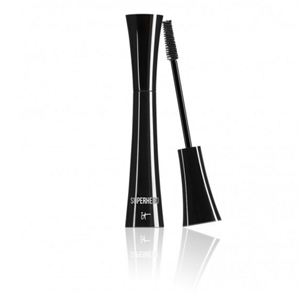 Transform you lashes with just one coat of Superhero™ Elastic Stretch Volumizing Mascara, new from IT Cosmetics. The Elastic Stretch technology wraps each individual lash in a volume-boosting, lengthening and ultra-conditioning black cape of power and color. Your lashes will appear stronger, longer, thicker and defined. Your lashes are wrapped from base to tips with powerful peptides and proteins, strengthening biotin, lash-lifting polymers and plumping collagen, taking your lashes to new heights! For more dramatic results, apply additional coats to volumize and lengthen. Superhero™ Elastic Stretch Volumizing Mascara, $24 is now available at itcosmetics.com, Ulta Beauty and ulta.com. This entry was posted in Profile by On Makeup Magazine. Bookmark the permalink.